THE SKINNY: This is the deep-action moisturizer from L'Oreal's ReviaLift line that fights wrinkles and plumps the skin. It's powered by something called Pro-Xylane, for which L'Oreal has a patent. It's supposed to stimulation collagen production. Over time, this moisturizer is supposed to improve the texture of your skin and then make it look younger and firmer. As promised, this is a really thick moisturizer. So thick, in fact, I find it impractical for daytime use. If I use it full-time, I'd only wear it at night because it feels heavy on your skin. It's not greasy and didn't add any oil or shine to my face, but I just didn't like the weight of it. Did it make my skin look better? Not that I noticed, honestly, other than making my skin feel a little softer. KEEP OR TOSS: Toss. It's too thick for my liking. 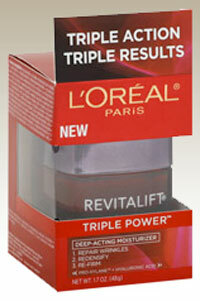 CHECK IT OUT: Read about all the products in the RevitaLift line at L'Oreal's website.